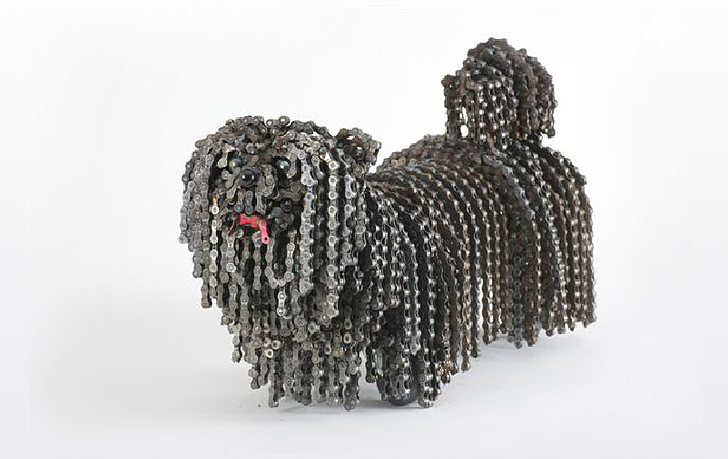 Artist Nirit Levav transforms rusty old bicycle chains into gorgeously realistic sculptures of man’s best friend. The Israel-based artist upcycles disused chains into life-size dogs of every variety. An avid junk collector, Levav welds together her creations to give them new life. Levav makes the regular rounds of bike shops and motor garages, finding beauty in the disused and rusted metal components that the shops tend to throw away. The artist collects and sorts these cast off gears and metal bits, seeing them as art media rather than trash. Taking inspiration from the materials themselves, the artist first conceived of making dog sculptures when contemplating a pile of her salvaged metal goods, her mind seeing an amorphous shape in the coils of broken chains. The first dog that Levav made was the rotweiler, thinking that the rough edges of the broken metal pieces would loan to the dog’s tough persona. But instead, the artist was surprised to have created a sculpture that was more friendly and cute than intimidating. That inspired her to experiment more with strings of bike chains and transform them into the long fur of an Afghani dog. Each dog inspired the next, and now Levav has a collection of full-size greyhounds, a bijan frise, a cocker spaniel, poodles and other mutts made from recycled bike chains, gears, pedals and even bike seats. The statuesque sculptures fuse Levav’s love of upcycled metal and dogs. Levav makes the regular rounds of bike shops and motor garages, finding beauty in the disused and rusted metal components that the shops tend to throw away. The artist collects and sorts these cast off gears and metal bits, seeing them as art media rather than trash. Taking inspiration from the materials themselves, the artist first conceived of making dog sculptures when contemplating a pile of her salvaged metal goods, her mind seeing an amorphous shape in the coils of broken chains. The first dog that Levav made was the rotweiler, thinking that the rough edges of the broken metal pieces would loan to the dog’s tough persona. But instead, the artist was surprised to have created a sculpture that was more friendly and cute than intimidating. This inspired her to play into the strings of bike chain, and transform them into the long fur of an Afghani dog. 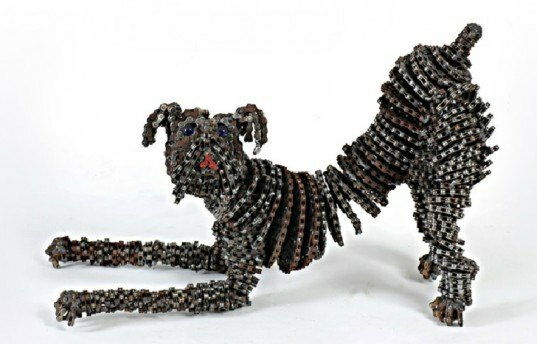 Each dog inspired the next, and now Levav has a collection of full size greyhounds, bijan frise, cocker spaniel, poodles and other mutts made from recycled bike chains, gears, pedals and even bike seats. The statuesque sculptures fuse Levav’s love of upcycled metal and the friendly dog.